Let us take a quick survey here, how many of you actually remember playing the Wooly Willy game back in the days when you were a wee lad? You know, the particular game with the bald guy who looked like the poor man’s Kojak, where you would then make use of a “magic” wand in order to give him a beard, mustache, and a head of hair. It seems that some smart aleck out there has come up with a picture frame that basically works on a similar principle. 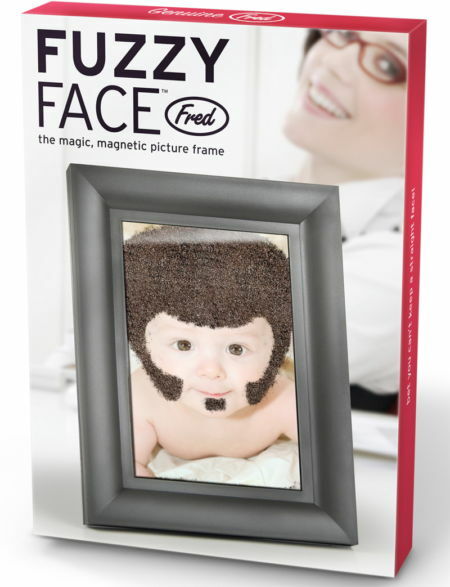 All you need to do is to place a 4” x 6” photo in the frame, preferably one with a close up portrait of someone you know, and use the “magic” wand (a magnet, actually) in order to draw hair where you think it belongs – whether it is growing out of one’s ears or not. This is a $17.95 gift that just about everyone is able to enjoy.